$25,000 in prize money. The top teams in barbecue. An unforgettable weekend in Southern Illinois. 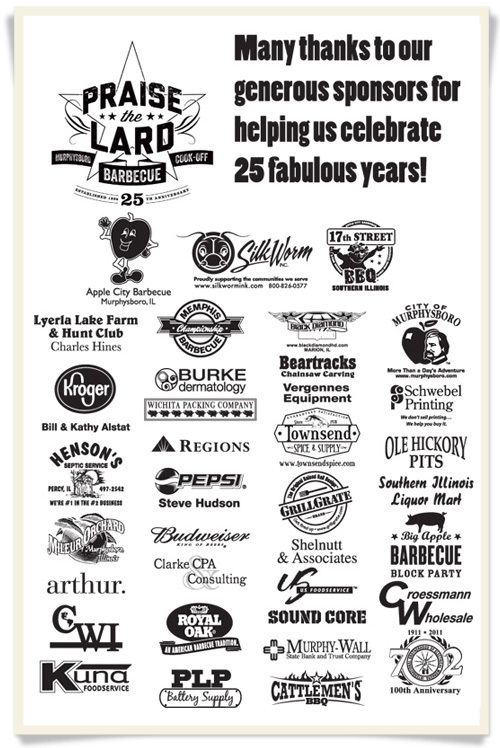 We’re in full planning mode for the 26th annual Praise the Lard Murphysboro Barbecue Cook-off to be held September 19–21, 2013. Team and judge’s applications can be downloaded from our website. The video below, produced by our friends at Arthur Agency, perfectly captures the spirit of the weekend. This three-day celebration provides numerous sponsorship and vending opportunities. We’re grateful to last year’s sponsors, many of whom have supported us for the past 25 years. Please be in touch with me if you’d like to help sponsor this year’s event. Hope we’ll see you in September!